As much as I’m enjoying Michael J. Sullivan’s other series The Legends of the Lost Empire right now, I have to say, nothing quite beats the feeling of coming back to good old Hadrian and Royce. The Riyria Revelations may have concluded years ago, but I swear I will never ever stop loving this awesome duo, and one of the best things the author did for his fans was to continue their legend in a series of standalone prequel stories called the Riyria Chronicles, intended to explore the early years of this partnership. Like the other books in the series, The Disappearance of Winter’s Daughter is a self-contained adventure featuring Hadrian, an idealistic ex-mercenary, and Royce, a cynical former assassin. Approximately three years have passed since the two were first brought together by fate, becoming the clandestine enterprise known as Riyria, selling their services as rogues-for-hire. Their latest client is Gabriel Winter, a wealthy merchant who has traveled a long way to seek out Royce, having heard of his reputation as a ruthless killer. That’s because Winter wants bloody vengeance—six months ago, his daughter Genny was wed to the Duke of Rochelle, a marriage that her father was vehemently against. Now she is missing, presumed dead after her carriage was ambushed on the way back from the market and left in a gore-soaked ruin. Suspecting that the Duke and his people are behind Genny’s death, Winter wants Riyria to put a violent end to those responsible. Ever the optimistic one, Hadrian is not entirely convinced that Genny is dead, but nevertheless he and Royce agree to travel to Rochelle to investigate and see if they can suss out any information regarding what happened to Winter’s daughter. When they arrive though, they discover an uncooperative and tight-lipped citizenry, cagey about the fact that a couple of outsiders are poking around. The people in this old-world city with its murky history and tangled political relationships don’t seem to want to talk about their missing duchess, and Royce and Hadrian’s line of questioning soon lands them on the receiving end of some unwanted attention. The Disappearance of Winter’s Daughter was another solid entry in the Riyria Chronicles, and I daresay it might even be my favorite of the four books out so far. 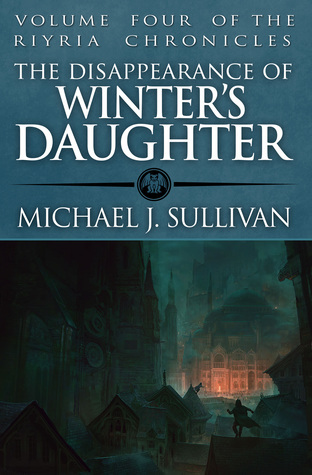 As a reader, it always amazes me to watch an author’s skill grow over time, and indeed Sullivan’s writing has become a lot more polished since the days of The Riyria Revelations and even when compared to The Crown Tower and The Rose and the Thorn. His stories are also becoming more interesting and complex, as this latest installment shows—proof that this series is showing no signs of slowing down or growing stale. It is truly impressive how Hadrian and Royce’s adventures have stayed so fresh and utterly captivating even after all these years and so many novels. On the subject of the plot itself, I always love a good mystery, so this book was perfect for me. From the very first chapter, I was trying to figure out what happened and how everyone was involved. Rochelle also made for a compelling setting, with its strict customs and superstitions. It’s a city of extremes where the nobility live in decadent excess, claiming descent from imperial aristocracy, while the Mir and other non-humans scrounge for scraps in dirty alleyways. Royce and Hadrian arrive in town during the festival in which a new king will be crowned, so the inns and taverns are also full to bursting and the streets are packed day and night. Despite the atmosphere of revelry, however, the tensions in the air are palpable, with undercurrents of hopelessness, anger, and resentment. Hats off to Sullivan for managing to capture this soupy mélange of chaos and confusion, using descriptive prose to arouse vivid imagery in the readers’ minds so that we are transported right into the heart of Rochelle. But of course, no review of a Riyria novel would be complete without mentioning the relationship between Hadrian and Royce. It’s the essence of this series, after all, and when The Disappearance of Winter’s Daughter begins, the boys are just starting to get used to working as a team. Minor personality clashes aside, they’ve become accustomed to each other’s styles, with genuine fondness to be gleaned from their banter even during disagreements. There are some great moments in this book where we get to see their bond strengthen, with trust forming as they learn to depend on one another and watch each other’s backs. Overall, I couldn’t have been more pleased with this newest addition to the chronicle. Fans of Riyria, I guarantee you will not be disappointed! Not only is this another prequel novel done right, I believe it to be the strongest of the bunch. Even after four books, there’s still so much potential in this series for more exciting and new adventures, and I hope Michael J. Sullivan will continue to keep these Hadrian and Royce stories coming for those of us who simply can’t get enough. Audiobook Comments: There’s no doubt that Tim Gerard Reynolds is the voice of Riyria. Once again, he delivers a fine performance, capturing the novel’s humor and heart with his pitch-perfect narration. He’s the main reason I opted to listen to the audiobook even though I’ve had the ebook version for weeks now, because I know anytime he reads a Michael J. Sullivan book, he’ll do an amazing job. Glad I was right! Nice review! I’m going to try to type mine up today and now I’m going to struggle to not copy yours. Oh yes, TGR is fantastic. He does great work in general, but I especially love his performance on Sullivan’s novels. I think it’s because he has a lot of fun reading them too. Yes, you may want to try these even if Revelations didn’t work for you; they won’t spoil the ending of that series, and MJS’s writing has also improved greatly since!